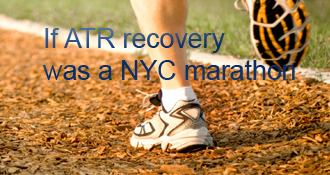 terphead has completed the grueling 26.2 ATR miles to full recovery! Hi everyone! I ruptured my achillies playing softball on 4/10/08. I was pitching in a slow pitch coed league on friday nights with my wife for a little exercise. I pitched a ball and it was hit away from me so when I took a step to watch the ball being fielded I felt and heard the famous pop eveyone talkes about. I thought I had been hit in the back of the ankle by a softball thrown by someone else. I stumbled and when I figured out what happened I immediatley layed on the ground and asked for help from teammates. The next thing I know were headed to the ER, 3 hours later the ER doctor say you damaged your achillies you need to see ortho doc. on Monday. This was a great way to spend Easter weekend. When I saw My Orthopedic doctor on that Monday he confirmed Full rupture. Surgery scheduled for the following Monday. (1 week later). Had surgery on 4/20/09. He said he was very pleased with how it went and he hopes if it looks good at follow-up I can go back in the boot instead of cast for 6 weeks. I’m a firefighter and I think he wants to give me some minor stretching exercises to help speed things up a little. If there are any firefighters out there who have had this situation I would love to here how long it took you to get back to full duty. He has told me 4-6 months. I go on 4/29/09 for staple removal and hopefully some good news on the boot I really don’t want a cast for 6 weeks. I will give update after follow up and good luck to all those sitting around trying to get through this. I am a firefighter in the UK and am 11 wks post op. I was in a cast for 3 weeks, then boot. Started pwb at 5.5 wks and fwb and walking in boot at 6wk. I was walking with a limp in 2 shoes at 8wk. I will be going back on light duties in June and hopefully operational in July. That will be six months. Robby, Thanks for your reply! I was wondering how you were making out climbing ladders and steps during your rehab to get back to full duty. I go to doctor tomorrow to have staples removed then have that long rehab to get back to full duty. If you have any suggestions to assist in the rehab I’m listening. Good luck with your recovery. Wow. I ruptured my Achilles tendon pretty much the same way on 05/03/09. A friendly game of soft ball among employees, and a ball hit deep to the outfield. I was playing second base and was watching the ball get tossed back in. I thought the runner had kicked me in the back of the heel as he rounded second base. Only problem — he was already past third. And I heard the infamous “pop.” I didn’t feel much pain, but I could barely hobble off the field. I’m now 3 weeks post op. I also ruptured my achilles playing softball. I was pitching and had just thrown a pitch and felt like I got hit in the back of the leg with a line drive. I thought the kids on the sidelines were screwing around and threw a ball that hit me but when I glanced back, there was nothing there. I also heard, and felt the pop. You’re braver than I, hobbling off the field—I went right down. I knew exactly what it was. I am 3 and a half weeks post op and have a lot of swelling around foot and ankle, as well as numbness and pinprick sensations in the side of my foot. Other than that, no pain. Good luck with your recovery. Hang in there, It will get better. I’m getting around pretty good now. It just takes a lot of time for this thing to heal. I’m hoping to go back to work next month and I was wondering if that day was ever going to get here. I think I’m going to stick to being our teams 3rd base coach now. Good luck with your recovery and thanks for the response! Good on you Dave, top effort mate. I am a couple of weeks behind you but also have noticeable atrophy of the calf (noticeable) and quad (not so noticeable). My physio encouraged me to do quad-raises as soon as I was FWB in the boot which helped me keep my thigh in shape, can highly recommend this for you. My calf looks like a noodle, however, which sux. Apparently it comes back a lot more quickly once you start really bearing weight. Good luck champ. And, thanks for the tips. I’ll definitely start using the pool as soon as I am out of my cast (7 days to go) and the doc says it is ok to do so. Thanks for the replies. I went to my first physical therapy session on Thur. night and she said it would be a couple of weeks before I would have enough strength in the foot to press gas pedal. I’m trying to get off the crutches however it’s harder then I expected. I can put half my weight with no pain at all then I hit a point where I feel pain and I don’t want to push it.I can stand in one spot with equal weight on both feet and have no pain at all. Rudedog did you have this problem when you were starting to put weightn on the foot? Celeste the swelling your getting at 3 weeks is normal I think eveyone seems to have swelling for quite a while.Good luck to everyone in your recovery! I ruptured my left Achilles Tendon. Drving wasn’t a problem at all. Drove with cast, walking cast and boot. None Weight bearing cast for 4 weeks. Full weight bearing cast for 2 weeks. Walking boot fot 2 then back in two shoes. Today I’m 9 months and a week Post OP. I got my cast off after 32 days and was told I could drive, use my right hurt foot without the boot on the gas pedal, break with the left. After I arrive at my destination, put the boot on. What you describe is normal. In general, you will need to teach your foot to walk again. In my case, when I was given the go ahead to place FWB - I had to use both my crutches (with boot) for a few days. I gradually went from 2 crutches to 1. After about a week I was walking without crutches (albeit with some pain/swelling). I found that elevation/icing helped with the pain/swelling. I also started physio at around 6 weeks post-op (i.e. the point at which I was able to place any weight on foot). Physio is great - you will notice huge improvements during the first 3/4 weeks of phsyio/hydrotherapy. With regards to driving - it depends on whether you ruptured right or left AT and whether you have an automatic or manual. In my case, I did my right AT and my physio seems to think that I will not be able to drive until I can do 5x one foot calf raise on bad leg (which I think is a bit conservative). As things stand, I feel that I am fairly comfortable with driving. Terpheads Achilles Blog is proudly powered by WordPress and WPDesigner..